For more than three decades, the University of New Hampshire InterOperability Lab (UNH-IOL), has served as an independent provider of broad-based testing and standards conformance solutions for the networking industry. During this time, it has become one of the world’s recognized leading testing facilities for data and networking communications products, as well as a pioneer in providing custom testing solutions. In addition, the UNH-IOL is dedicated to training future engineers in a hands-on, collaborative work environment where students are doing all the in-house testing while attending UNH. That training is how I started working for the UNH-IOL eight years ago – first as a Test Engineer during my electrical engineering undergrad days, and then continuing as the Ethernet and Storage Technical Manager while I completed my master’s and beyond. This experience at UNH-IOL had a direct impact on the knowledge, understanding and interest I had in the networking field when I graduated. The UNH-IOL provides me the opportunity to work with industry associations and standards bodies related to the technologies in which they support. We provide critical interoperability and performance testing for vendors and their customers and we’ve been working with the NBASE-T Alliance since 2016 to increase awareness of the technology. Our BASE-T plugfest events allow companies to test products with other partners in realistic environments on a neutral playing field. Why does this matter? In the Ethernet world, equipment is expected to work and interop testing like this is a key component of delivering this value to the market. 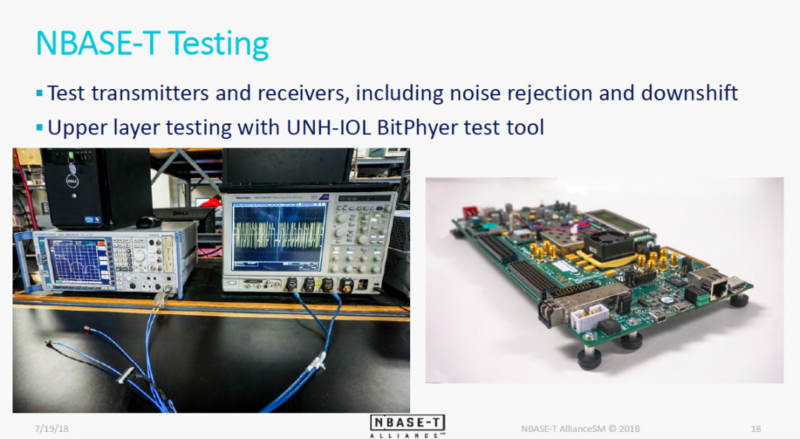 Interoperability was the first focus, but standard conformance testing for EEE, downshift, and noise rejection testing, typically performed at the UNH-IOL by student test engineers, was also key in bringing a standardization across the various Test & Measurement vendors. UNH-IOL also has a successful record of leading the technical work for interoperability demonstrations, including for the NBASE-T Alliance at the 2017 and 2018 Interop ITX events. Most recently, NBASE-T Alliance chair, Peter Jones, and I recorded a short, 20-minute webinar discussing how the UNH-IOL and NBASE-T work together to help move NBASE-T technologies forward. 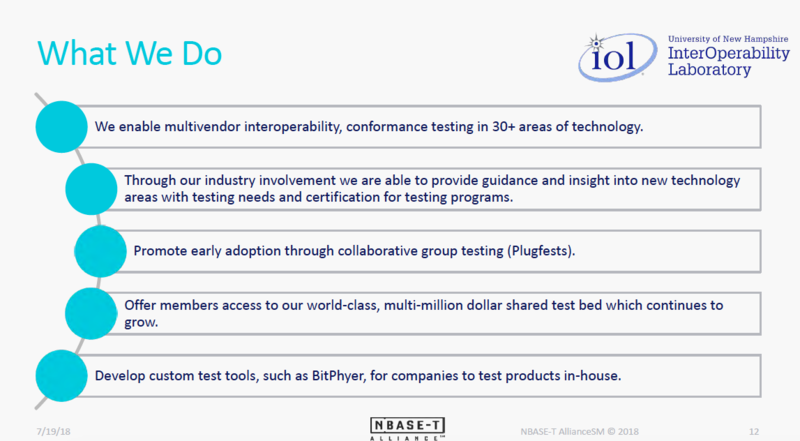 Check out Testing & Interoperability : How the UNH-IOL Continues to Impact NBASE-T Success. Peter and I can talk about Ethernet for hours (or days), but we had to stop somewhere. Reach out to either of us to continue the conversation.